Silvaplana is a quiet and traditional village surrounded by a surreally beautiful landscape with frozen lakes, snowy forests, hiking paths and magnificent cross-country ski pistes. Silvaplana is an absolute paradise for snowkiters, since this spectacular sports discipline was invented on the frozen Silvaplana Lake. Silvaplana has become a meeting place for sports enthusiasts from all over the world. Silvaplana lies below the Julier mountain and includes two distinct parts separated by a bridge between Silvaplana Lake and Lake Champfer. Corvatsch is the highest lying mountain station of the Eastern Alps, with a top station of 3303 meters. Silvaplana is located in the Graubünden region and is only 5 kilometres south of St.Moritz. Silvaplana Lake District and the snowy stone pine forests invite you to enjoy amazing skiing holiday. Silvaplana offers you two hundred kilometres of well-prepared cross-country pistes with panoramic views and a breathtaking backdrop of snow-covered Swiss Alps. Silvaplana has a large variety of accommodation available: everything from hotels to cosy chalets and apartments. The village has a wide range of many different shops, bars, lively cafes and restaurants. Another sports activities include fun park, snow park, halfpipe, ice-skating, toboggan-run, snowshoe tours, timekeeping run and an ice-rink with facilities for curling. Also, you can explore the snowy mountains of the Engadin and winter hiking or snowshoe through the Corvatsch area. Breathtaking mountain panorama frames the lake landscape around the Corvatsch. Silvaplana is definitely a place worth visiting! Train options to Silvaplana are available. There is a train station in Silvaplana, which is about 7km and 10 minutes drive from the city centre. Switzerland is well known for its efficient rail network, but we still recommend you to order direct airport transfer to get to your chosen destination. That is the most convenient and time-saving option. We always carefully calculate all resort transfer services individually, to ensure that our customers never overpay. Whenever you choose to travel and whatever your final destination, Alps 2 Alps will get you there for the best possible price. However, we advise booking early to access the best possible deal. In addition, keep up to date with Alps 2 Alps for the latest offers, deals and discounts on Silvaplana resort transfer services. All of the above will only ever result in our base-rate for ski transfers going down – we never over-inflate our prices at any time or for any reason. We also offer substantial discounts for off-peak, off-season and midweek transfers to Silvaplana. If looking for the best possible deals, travelling outside peak season or midweek typically results in the biggest savings. We offer midweek (Monday to Friday) prices with up to 60% discount than weekend prices. Your transfer quote will also depend on vehicle availability, transfer schedule, vehicle utilisation and other costs like road tolls and airport parking charges. In all instances, we work hard to keep our prices low and are relentlessly committed to total value for money. Which is why we guarantee you won’t find a better deal on your Silvaplana resort transfers, whatever your needs. The resort of Silvaplana lies at an elevation of 1,870m, with a max vertical of 1,433m and its highest lift going as far as 3,303m. 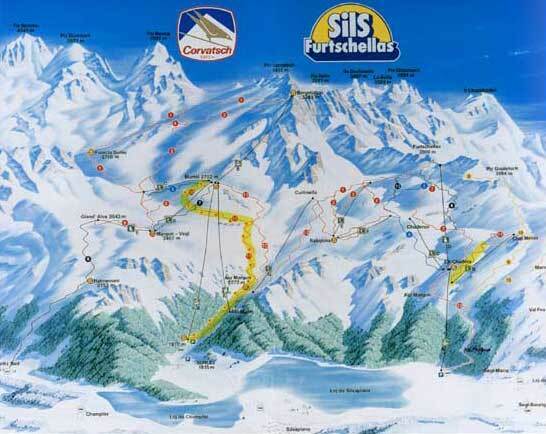 There are a total of 12 pistes in the immediate vicinity of the resort, served by 7 ski lifts. There are a terrain park and a half-pipe for snowboarders. Around 17% of the slopes are ideal for beginners, 74% serve the needs of intermediates and the remaining 9% is far more challenging. In Surlej, the easternmost part of the Silvaplana village lies a cable car bottom station that services the runs off Corvatsch and links to the Furtschellas pistes. In the lighted night ski area of Corvatsch, you can find the longest night ski piste in Switzerland. On Friday nights the lower slopes are floodlit and open until late. Silvaplana lends itself perfectly to family holidays. Silvaplana Top Snowsports school offers a ‘Ski Safari trip’ for children groups and kids winter sports camps. Your kids will be fully supervised in all-inclusive camp program, while parents will be able to enjoy their ski holidays. Experienced ski instructors will give the children some great tips and tricks how to ski. At Alps2Alps we think that Silvaplana ski resort transfers are about so much more than getting you to your final destination. After all, you also want to arrive comfortable, refreshed and ideally on time. Not all resort transfer services can promise this – Alps2Alps guarantees a higher-level service for every passenger.